There are plenty of people in business who aren’t engaged in authority marketing. You might be one of them. That’s what makes authority marketing work so well – the fact that not everyone’s doing it and those that do are getting the attention. So, what is it that prevents people from using authority marketing when all evidence suggests that it’s the best way to grow your reputation and value in the marketplace? 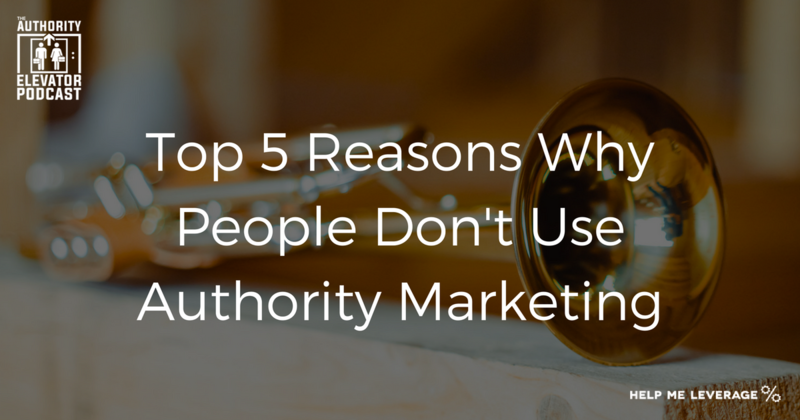 We’ve uncovered the top 5 reasons why people don't use authority marketing. Have a read or listen here and if they resonate with you, learn how easy it is to overcome them. Most of us don’t like drawing attention to ourselves. Since this is exactly what authority marketing is about, we can feel a bit uncomfortable with the idea. The truth is, authority marketing shouldn’t be all about you. The way to do it without it sounding like a brag is to frame your knowledge within the context of helping your customer. In this way, it’s less about telling everyone how wonderful you are, and more about telling them how useful you are. This is one of the key guiding principles of authority marketing. (You can read about the others here​). Bear this in mind and you can showcase your expertise without sounding like you’re tooting your own horn. Writing blog posts can be time consuming. A single post can take several hours to compose. That’s a lot of time when you could be earning money and it’s hard to justify taking time out to come up with the content. However, these days it’s much easier to produce content than ever before. Instead of having to sit down and write laborious posts, there are a number of ways you can speed up the process. Here at Help Me Leverage, we help our clients save time with content production by drawing out their knowledge using audio. We interview them or they dictate their thoughts on-the-go and we harvest this material for use in several blog posts. With the minimum amount of effort, you can outsource your content production and promotion. So, if you think you don’t have time for authority marketing, there are simple ways around it. Many people worry that authority marketing is about being unique. The problem they have is they think it’s all been said before. Though you may not have anything earth-shatteringly new to say, the thing is, you’re saying it now and differently to a new audience. And that’s what makes it unique. You really don’t have to reinvent the wheel. Just make sure you put your own spin on the topic and launch it onto the radar of those who need to hear it - regularly. Don’t assume that because you know something everyone else knows it too. It doesn’t have to be profound. More than anything, it just has to be useful. We’ve already mentioned that it can take some time to put a blog post together. And that’s just the start of it because there are recurring tasks that must happen to make the most of each post. After it’s written, you must find a suitable image, publish it to your blog, then promote it on social media not once but many times. If you don’t have a system in place for all of this, it will take a lot longer than it has to. On the other hand, if you have templates, processes and people set up to facilitate this, then all the work can be condensed and accelerated. For example, using a scheduling tool like CoSchedule, Hootsuite or Buffer will let you to post from just one interface, instead of having to log on and post to several individual social media platforms. Putting systems in place will help make your authority marketing efforts less painful and far more efficient. The truth is, it takes quite a bit of time to get traction with authority marketing. Building your following and reputation doesn’t happen overnight and some people feel a bit impatient. The key is to approach it as a long-term investment. Yes, you might get some response within a few weeks, but you mustn’t bank on it. Expecting to put in at least six months’ effort before seeing results and growth in your social media following and mailing list will make early benefits a welcome bonus. You can choose to accelerate this by using paid advertising, or you may be lucky enough to have a thought leader share a post making it go viral. But authority marketing is playing the long game. You must be patient, but it will pay off. If you recognised any or all of these excuses reasons as ones you’ve used to avoid engaging in your own authority marketing, I hope this has convinced you that it doesn’t have to be a struggle. The truth is that venturing into an authority marketing program with a streamlined system, the right attitude and realistic expectations will make the benefits far outweigh the costs.